We are happy to announce that our next Bindis in Business Networking Event has been moved forward – this one is going to be huge!!!! So much excitement and buzz is being created at the moment around our Guest Speaker…..we are so happy she has confirmed and will be gracing our event….. Since she will be flying off to Dar es Salaam at the end of July, we didn’t want her to go without showing you all her amazing work! You only have 2 WEEKS TO BOOK for Thursday 10th July, same time, same place!!! 9.30am until 11.30am, at the Waterside Inn, Leamington Spa, CV31 3JZ. Introducing Veena AmenRa, an ex member of the first ever British Asian RnB Girgroup called Freedom Angel turned Certified Law of Attraction Life Coach. 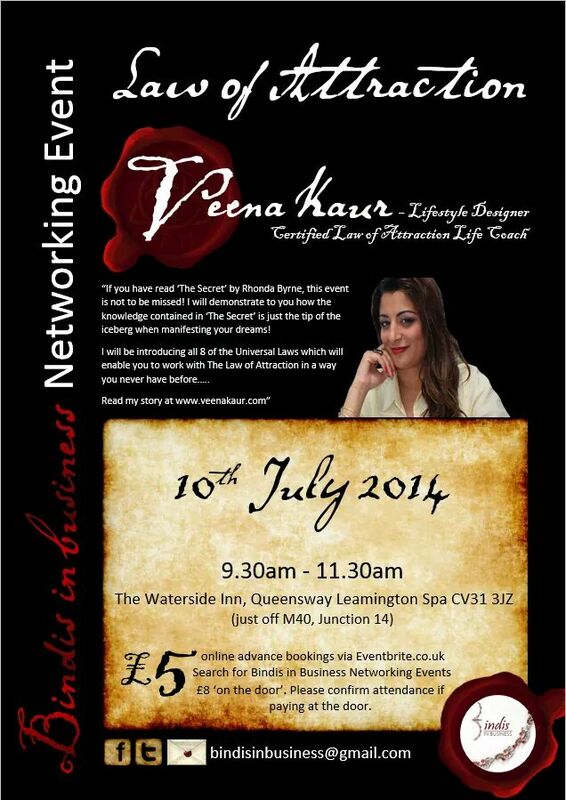 Veena one of very few Asian female business women in the UK who teaches the powers of the Law of Attraction and will be our Bindis guest speaker!!! You must must must visit her page www.TheSecretLifeCoach.com and read her story….. It will make you think, it will make your choke and it will inspire you to follow your dreams! If you are motivated by the philosophy that ‘like attracts like’ and you have read The Secret, by Rhonda Bryan then this is event is for you! This event will be open to all women so invite your friends, family and colleagues! You will even have the chance to have a 10 minute one-to-one with the amazing Veena! If you are bored of the same old type of networking event with the same old faces and you want to meet, mingle and make business with like minded female professionals Bindis In Business Networking Events are for you. Do you want to know more about Law of Attraction and how to use it to help your business or personal life? If so then you need to attend this one of a kind networking event! Book now to avoid disappointment. This is guaranteed to be a sell out event!